Rat Pack and Swing Singer for Hire - Weddings, Parties - AND A BIT OF ELVIS TOO! Whatever your event, a large scale wedding, a corporate function or a small family party, Danny will have your guests talking about the event long after it’s finished! Unsure of ideas for a party or special occasion? Why not hire a great entertainer like Danny, singing some of the greatest songs of all time - loved by all ages? 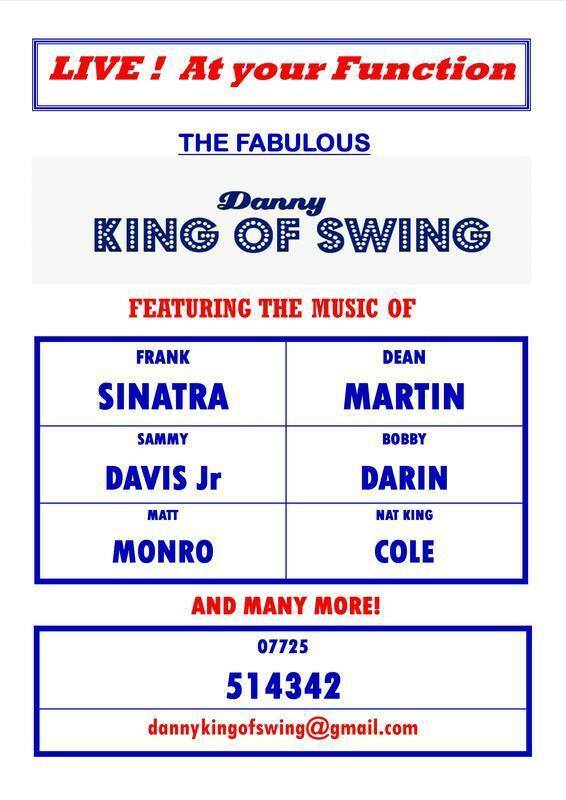 Singing timeless classics from artistes such as Frank Sinatra, Dean Martin, Nat King Cole and many more, Danny will tailor his performance to your precise requirements. Danny has experience of performing at many different types of function. If you are unsure what timings or set-list might be suitable at your event, just get in touch with Danny and see what might work best for you. Danny is based in the North West of England, but performs all across the UK, and he will guarantee your party goes with a swing! Danny prides himself on producing a quality show every time. Once booked, you can rest assured everything will be plain sailing. Danny will contact you again in the lead up to the event just to ensure plans are still the same. He will arrive at your venue early and perform a ‘sound check’ in advance of your guests arriving. Courteous and good natured, Danny will ensure you can relax and concentrate on enjoying the rest of your event. It's hard enough organising events as it is and dealing with Danny is hassle free. Danny produces a head turning performance at every show, and a lot of his bookings and enquiries are from people who have watched him perform at a function they have attended. Get YOUR booking in the diary now before it's too late. Contact details are on the right, or fill in the simple on-line form to make an enquiry. "...you came recommended, and really got the party going..."
"....so many good comments from everyone...it was a pleasure having you along...."
.....fantastic show with some classics that were as good if not better than the originals - seriously!! Will be booking Danny again for our next function! ........so many guests commented on how good you were Danny. We thoroughly enjoyed listening to you and it was the perfect backdrop to our champagne reception... Thank You! Add a touch of class to your event! Book a GREAT entertainer - it's a no brainer!